A classic caprese sandwich is typically loaded with a bunch of fresh mozzarella, a few tomato slices, and torn basil which are then lathered with a olive oil and balsamic vinegar, salt and pepper. 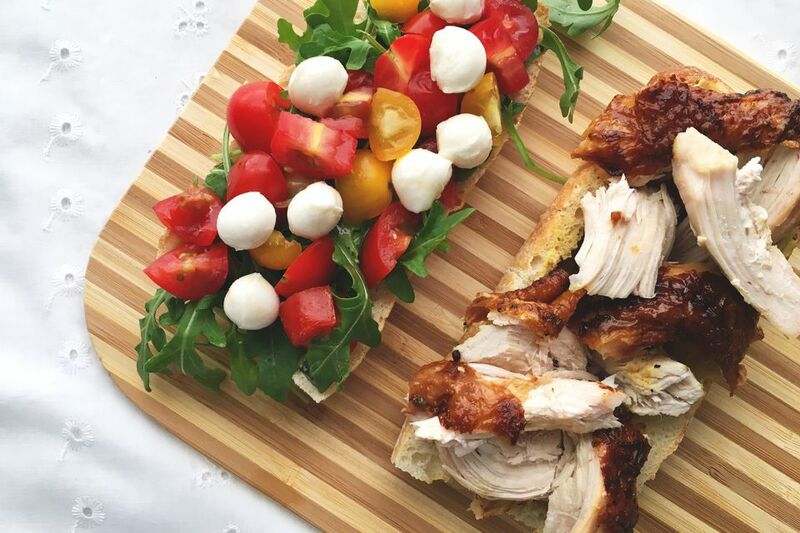 And although this sandwich isn't all that bad to begin with, we created a healthier version by hallowing out a whole grain baguette and adding rotisserie chicken for protein. We replaced olive oil with flavorful truffle mustard and white balsamic glaze. And instead of the traditional fat slabs of whole milk mozzarella, we swap out tiny pearls of the fresh cheese to cut down on fat. Arugula gives the sandwich a nice peppery bite and adds a bunch of vitamins such as A, K, and C as well as folate and calcium. The tomatoes are not only a great form of antioxidants but are also packed with lycopene which helps prevent cancer. Not too shabby, huh? Cut the loaf in half and gently pull out the interior bread so that the baguette is hallowed out. Toast bread until desired crispiness is reached. Smear the bottom half with the truffle mustard and place the pulled rotisserie chicken on top. On the other half of the hallowed out baguette, add the arugula and drizzle with the white balsamic glaze. Add chopped heirloom cherry tomatoes and the mozzarella pearls and sprinkle with a pinch of salt. Close the sandwich and serve. Tip: This sandwich can be made up to a day in advance if refrigerated but is best served while the bread is hot and crispy right after its made.